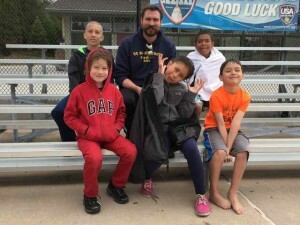 The Aquatics Program at Boys & Girls Clubs of Santa Cruz County is making waves this summer with its new water polo program, swim team and swimming classes for various skill levels. There are a couple of slots left in the water polo program, which started on June 13 and runs through the summer at a cost of $65 per participant. In the program, participants learn fundamental aspects of the game, with a focus on conditioning so that players have the ability to withstand an entire game. This includes treading water and passing and shooting. Aquatics Director Jason Huggett, who leads the program, said what players learn in water polo transfers well into other sports. “It teaches them how to strategize and work well as a team,” he said. Huggett also leads swimming classes, which are designed to serve the needs of participants of different skill levels. The most popular course, which is nearly sold out for the summer, is for students who are comfortable in the pool but need to learn core techniques. There also are courses for students mastering free-style swimming and those preparing for advanced swimming. At $45 for two classes each week for three weeks, the cost of the class is designed to serve a wide variety of family income levels. “It’s really nice to serve people here who otherwise wouldn’t have the opportunity to swim,” Jason said. The Swim Team meets year-round — three days per week for nine weeks at a time — at a cost of $65. The practice period lasts about 75 minutes, which is designed to improve swimming and teamwork skills. The team finished second out of four teams who competed locally in May. “We serve that middle range of kids who are looking to have some fun in the pool without it being too serious or too competitive,” Jason said. To learn more about the Aquatics Program, click here. I’m interested in finding out more about your swimming programs there. What days of the week does the swim team meet?